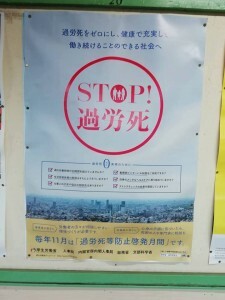 On an empty train station platform in rural Japan, there is a poster pasted on the wall with a message in imposing red letters: “Stop Karoshi!” Karoshi is a phrase meaning ‘death by overworking’, and the concept has become so normalised that it has entered the Japanese lexicon. The phenomenon, despite efforts to counter it, appears set to stay. At first glance, the Japanese government appears to be working hard to battle the nation’s unhealthy working hours, but its current approach is at best superficial and at worst a purposeful avoidance of the problem. The first case of Karoshi was recorded in 1969, and since then the number of annual deaths has not reduced. According to the Japanese labour ministry, 190 people died of karoshi in 2017. Almost half of those were suicide victims, driven by their working hours to take their own lives. Karoshi came more clearly into the public eye after the death of Miwa Sado, a journalist at NHK, Japan’s national public broadcasting organisation. She was found dead in her apartment still clutching her phone. She had clocked up over 159 hours of overtime in the month leading up to her death. Attempts by the Japanese government to address the overwork epidemic have been widely ineffective, though the need for change is reflected in the statistics. According to a survey in 2016, 1 in 5 of the working population is at risk of Karoshi. 21% of the working population are working over 49 hours a week, yet work productivity is at the very bottom of the G7 and below the OECD average. Instead of benefitting productivity, the long work hours affect the health of workers to a dangerous extent. Even outside of the Karoshi statistics, there were 750 worker claims in 2015 due to brain and heart failure resulting from work stress. Last June, the Japanese government introduced Hataraki-kata Kaikaku, a new plan to combat the country’s overworking problem. Overtime is now capped at 100 hours a month, of which any is illegal without a written agreement between the employer and the employee. Though an average Japanese worker receives 20 days of annual paid leave, many do not take it as long holidays are perceived as irresponsible in Japan. Because of this the new government plan includes 5 days of forced paid holiday a year. It takes little effort to see that these measures do not go far enough. 100 hours a month of overtime, if taken, equates to increasing weekly hours by over half. Due to the work culture in Japan, many workers will feel obliged to take overtime to the 100 hour limit. The same situation is likely to emerge for the minimum holiday policy. 5 days will be taken, but no more. In short, the new government plans do not address Japan’s overworking culture at all, but simply change the threshold from within it operates. Hataraki-kata Kaikaku also has an intentional loophole. The newly imposed caps are all eliminated for those making three times the average income. According to the government, this will allow employees to be paid based on performance rather than the hours they work. The claim is however unconvincing. If the cap exemption were truly a performance improvement measure, it would be applied to everyone, not just the highest earners. The exemption suggests instead that the current system relies on overworked leadership and management and that the government has no sufficient plan to tackle this for what it is: a severe structural crack in the Japanese labour force. There is a very good reason why the Japanese government is struggling to fix the overwork epidemic. Overwork is deeply ingrained in the nation’s work culture. Effort, responsibility to family and superiors, as well as self-sacrifice are age-old pillars of Japanese culture, and in the modern age these ingrained norms have been transferred from feudal lords to the modern corporation. In the context of modern business, the old cultural standards contribute strongly to Japan’s overwork problem. Unfortunately, culture cannot be changed by policy alone; it requires wide reaching social change. Japan is however thoroughly resilient to the social change it requires, a fact which reveals itself on numerous levels of Japanese society. The country is often heralded as a futuristic tech giant, yet still relies on fax machines and remains a cash based society. Japan has often played a major role in setting international environmental goals, but has failed to adjust its over-packaging habits. In the political world, an apathetic Japanese electorate vote for leaders they are dissatisfied with to keep a status quo. Japan does not do change, and in the world of work, that resilience is harming it. Victims of overwork are unlikely to reduce any time soon in Japan. The deep cultural norms that the phenomenon stems from make Karoshi very challenging to sufficiently resolve, and the government’s attempts seem entirely lacklustre. The measures even appear to intentionally avoid the heart of the problem – the work culture itself. That problem is exacerbated by Japan’s hard resilience to social change. Some change may however be on the far horizon. With high profile cases such as that of Miwa Sado in the public eye, the call for tangible improvement may gradually grow stronger. Tim is a first year ALT living in Hojo. Before joining JET, Tim was a language student in the UK studying German and Chinese. When not teaching, he is generally writing or playing music. This entry was posted in The Mikan, Uncategorized and tagged death, Japan, life in Japan, politics, work, work culture on January 29, 2019 by ehimerateam. I find it difficult to read an article critical of a Japanese societal issue by someone who is, I’m assuming (based on the forum), a foreigner living in Japan. At the very least, it would have been decent of you to provide the opinion of a Japanese person. I feel as though it’s like if a Japanese person visited/lived in America, read some articles/statistics about gun violence, and then wrote their own article (intended to be viewed by other Japanese people, not Americans) about the societal issues causing gun violence and the ways societal norms resist change to the current regulations. I wouldn’t necessarily be able to dispute the claims made in such a hypothetical article, but as an American, I would still want to see the opinion of an actual American portrayed in the rhetoric. I would take offense to a foreigner criticizing an American societal issue without including the voice of Americans in the criticism. Hi! This is the editor who approved the article. Thanks so much for giving your perspective! We do genuinely appreciate engagement with our articles. The main thing I’d like to clarify is that this site is run both for and by participants of the JET programme, who by design are not themselves Japanese. Although the desire for another point of view is admirable, this blog is dedicated to providing a platform for non-Japanese people to describe their experiences and perspectives on living in a country they are not native to. It wouldn’t really be an appropriate place to include a significant contribution by a Japanese person unaffiliated with the JET programme. Tim has taken his observations, undertaken research and has attempted to show that his observations are part of a larger trend in Japanese culture. You’re more than entitled to feel the article would have been stronger with more perspectives, but our goal is to ensure JETs, including former and perspective JETs, are able to discuss with each other what they have noticed about the society they are living in, rather than providing impartial journalism. What are you even trying to argue for? You could like a complete idiot who is just complaining to complain. The author is merely talking about a VERY well known issue that Japanese workers suffer from. He does not need to be “Japanese” to comment on it; nor would you need to be American to comment on issues of American gun violence. It helps to get an outside opinion, that is the whole point of therapy. Go be a troll somewhere else. Hi! I’m the editor who approved this piece. I’m unsure if you are the same anonymous commenter as before, but thanks for your input! However, if you haven’t already, I’d really recommend reading some other articles to get more of a feel for the kind of writing we host on this blog. If we only had people writing about their areas of expertise, I fear it would lose a lot of the human and personal perspectives that make it so interesting. As for the bio, it is simply meant as an insight into the kind of person the author is, not a comprehensive resume. In addition, I feel that ALTs have quite a lot of firsthand experience in observing overwork culture. We (as Tim and myself are both ALTs) have a unique view into an industry prone to overwork. As for the implication that JET ALTs are somehow unqualified to discuss work culture in Japan, I was a teacher in Australia, and some of the teachers I work as an ALT for now were once themselves ALTs in Australian high-schools. I don’t find their perspectives “comical” at all. The way they describe Australian school culture is fascinating, and allows me to see my position both here and in Australia from a new perspective. It appears your comment was cut off, so my apologies if you intended to clarify or expand upon your points, but your perspective is appreciated.